The 309MW Rentel wind farm in the Belgian North Sea has become Belgium’s fifth fully operational offshore wind farm. Rentel has now joined the ranks of C-Power, Belwind, Northwind, and Nobelwind. The combined capacity of the five wind farms is 1,186MW provided by 274 wind turbines. With the addition of the capacity from Rentel, Belgium is now fifth in the global offshore wind capacity rankings, with the Netherlands sliding to the sixth position with 1,118MW of operational capacity. 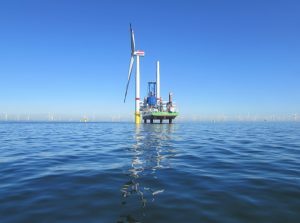 In 2018, Belgium’s wind farms produced 3.4TWh of electricity which corresponds to the annual electricity consumption of about one million Belgian households, the Belgian Offshore Platform said. By 2020, Belgium is expected to have 2,262MW of offshore wind capacity, following the scheduled commissioning of the 370MW Norther in 2019, and the addition of the 219MW Northwester 2 and the 487MW Seamade in 2020. Rentel comprises 42 Siemens Gamesa D7-type turbines, each with a 7.35MW individual capacity, installed some site 40 kilometers off the coast of Ostend. The wind farm is owned by a consortium of eight Belgian shareholders, including Otary Offshore Energy, DEME Group and Elicio NV.